Uppsala, Sweden—April 23, 2012—Today, IAR Systems® introduces version 1.20 of the high-performing development toolsuite IAR Embedded Workbench® for RL78. The new version brings highly efficient speed optimizations. IAR Embedded Workbench is a full set of development tools for building and debugging embedded applications. It includes a project manager, editor, compiler, assembler, linker, debugger, and library tools in a user-friendly integrated development environment. Thanks to the longstanding and solid relationship between IAR Systems and Renesas Electronics, IAR Embedded Workbench for RL78 was the first set of development tools to be made available for the RL78 family. From start, the compiler has created very compact code, for example by using intelligent linking and making full use of the hardware multiplier/divider for faster arithmetic. This makes the execution run faster and allows the microcontroller to enter one of its low-power modes after fewer clock cycles. Because the RL78 family is specifically designed for use in low-power applications, the power-saving contribution from having highly optimized code is extremely valuable. Version 1.20 of IAR Embedded Workbench for RL78 brings even more improved optimizations. The code generated for integer arithmetic and floating-point operations is now several times faster compared to the previous version. Code inlining has also been improved and smaller and faster math functions are now available in the runtime libraries as an alternative to the default, more precise, implementation. The new version also introduces new device support, OCD trace support, Subversion integration, and a new licensing management system with features such as commuter licenses, automatic license activation, and support for virtual servers. Also added is support for XLINK checksum units larger than 8 bits. This makes it possible to match the linker-generated checksum with the one computed by the RL78 CRC hardware. 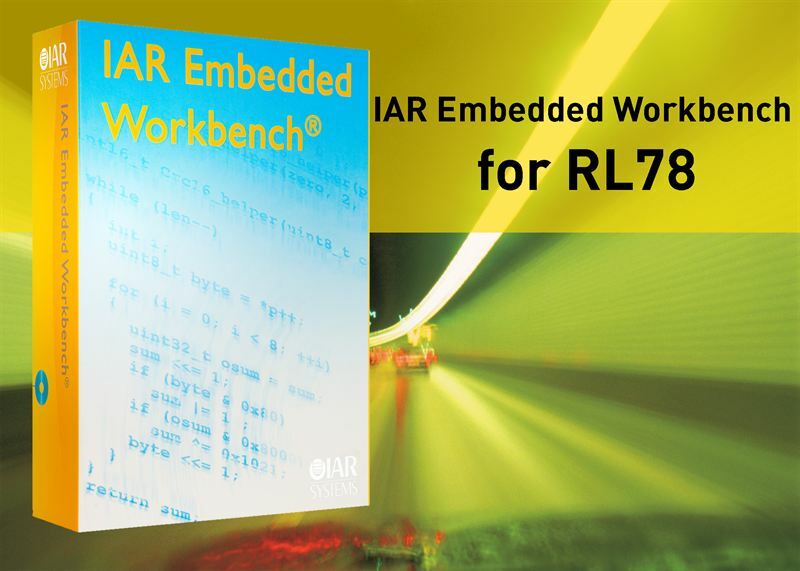 Evaluation licenses of IAR Embedded Workbench for RL78 are available for download at www.iar.com/ewrl78. Editor's Note: IAR Systems, IAR Embedded Workbench, C-SPY, visualSTATE, The Code to Success, IAR KickStart Kit, IAR and the logotype of IAR Systems are trademarks or registered trademarks owned by IAR Systems AB. J-Link, J-Trace, and I-jet are trademarks licensed to IAR Systems AB. All other products are trademarks of their respective owners.